The Business4Good Blog Think Good, Do Good, Be Good. 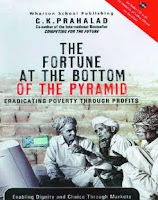 : Business and the Global Poor: "The Bottom of the Pyramid"
Business and the Global Poor: "The Bottom of the Pyramid"
With interest I have been following the discussion on "the Bottom of the Pyramid" (BOP) which means the 4 billion people poor who live on less than 2-5$ disposable income per day. There is an interesting overlap with Corporate Social Responsibility, Social Entrepreneurship and Microfinance because all these concepts somehow link "business" with "social". Although the definitions vary the idea behind the BOP discussions is clear: "How the global poor can become producers as well as consumers?" and "how can poverty can be alleviated by business activity?". Ideally, this would be a win-win situation for business (new markets, new customers, growth) and the poor (affordable products, employment, income). Simple examples include shampoo that works best with cold water or soap in very small sizes affordable for the poor - both even improve health by reducing diseases. Here a good article from the Harvard Business School.